This recipe also comes from the wonderful Oh She Glows blog. I particularly love that if your squash is already cooked, this literally only takes minutes to whip together. So it's perfect for those nights when you realize you've forgotten to pull a pre-made homemade meal out of the freezer. Jérôme and I both quite liked this. Logan, on the other hand, turned his nose up at it instantaneously. The minute I put it down in front of him, he passed it right back to me, saying "all done". And then "fini", just in case I hadn't fully gotten it when he said it to me in English. I got it kid. I'm bilingual too. In fact, we're the ones teaching you to be bilingual. I just thought that if I ignored you, you might actually try to put some of this in your mouth. Now here's the thing. I have recently become increasingly aware of the crap that Logan is fed day in and day out at daycare. Like how they've told me that he refuses to eat whole-wheat bread there, so they just give him white. Which just knocked my socks off because I do not ever, ever, ever buy white bread and he eats whole-wheat just fine at home. In fact, he eats dense whole-grain breads, with added flax, sunflower seeds, etc. etc. at home. But little monkey has figured out how to get himself some white bread when I'm not around. And I've been told over the past two weeks how well he now eating, all of a sudden: "He ate a whole hot dog! ", "he ate two chicken fingers and some fries!! ", "he loves his chocolate muffins!!! ", "he ate some meat pie!!!!". The only comment I was even slightly satisfied with was "he ate his chicken and rice stir fry and even ate his broccoli". Now that one deserves an exclamation mark! My personal favourite was the time that I picked him up, his face covered in sugar, as he was snacking on Cinnamon Toast Crunch. And his daycare provider went on to tell me how healthy it was, given that it was whole-grain (insert expletive here). What just turned 21 month old needs hot dogs, chicken fingers, fries, chocolate muffins and Cinnamon Toast Crunch???? Now don't get me wrong. I'm not against him ever having any treats. We gave him birthday cake on his first birthday. And I occasionally give him pudding (sometimes this avocado pudding), or some baby cookies. And on the odd occasion, maybe even a little taste of something sweet we're having. But I don't feel that it needs to be a part of his everyday (or even, every week) experience. No wonder he turns his nose up when I give him this lentil and squash stew or South American black bean soup for dinner. What kid would eat that when he can shove himself full of Cinnamon Toast Crunch mid-afternoon??? 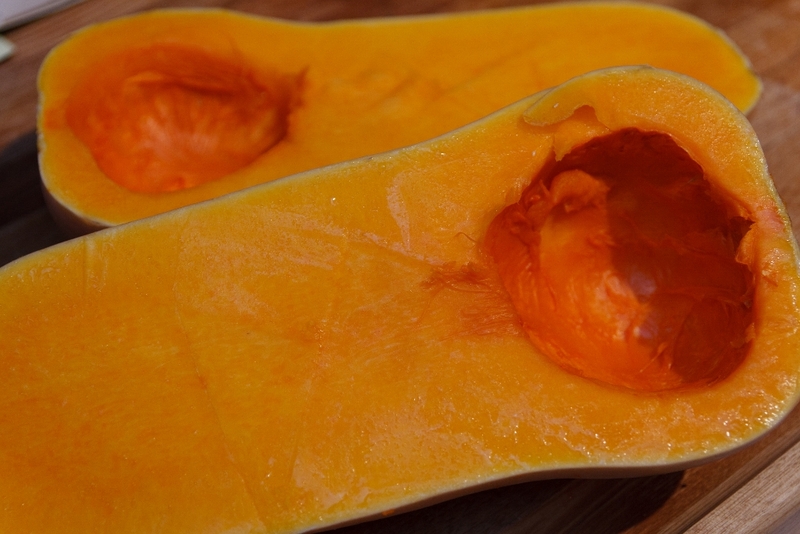 This recipe calls for the squash to already be cooked. I cooked mine in a veggie steamer. Simple as can be. Just cut it in half, scooped out the seeds, and threw it in the veggie steamer until cooked (maybe 20-30 minutes??). Then I let it cool and scooped out the flesh. You've just gotta remember to put some water in the veggie steamer, which seems to be a bit of a challenge for me these days. What to do if you don't have a veggie steamer? Well, you should get one. It's the easiest way to prepare healthy veggie side-dishes with essentially no effort. But if you don't want to get one, check out this link here on how to cook butternut squash in the oven. You can get going on the rest of the recipe while your squash cooks. My sister also suggested I use much more than the suggested 1 C of spinach, as she found that wasn't enough. So I just dumped in all of the spinach I had left in my fridge. And it didn't seem like too much (well, perhaps in Logan's opinion in was too much!!). 1. 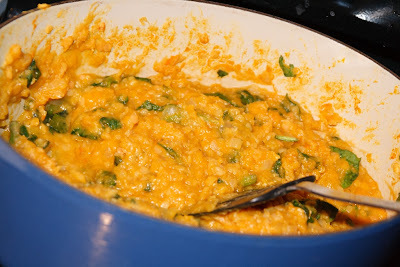 In a large pot, add olive oil, chopped onion and minced garlic. Sauté for about 5 minutes over low-medium heat. 3. Stir in cooked butternut squash and greens of choice. Cook over medium heat for 5-8 minutes. Season with salt, pepper, and add some freshly grated ginger to taste. 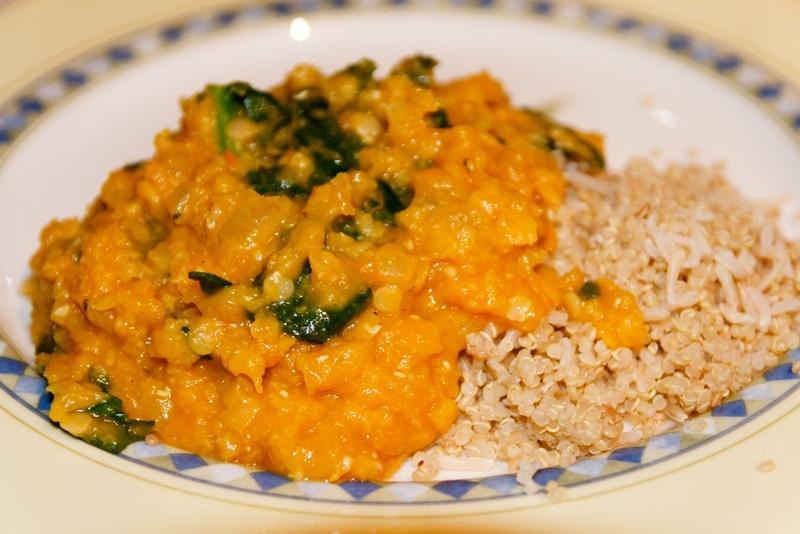 We served this with quinoa, to increase the protein content of the recipe.